Added the promised the second infantry line but its also where I stop. I went and made a version of the Fanatic that is wielding a proper rifle. Moved his arm down, gave him a hefty gun, then recolored his robes from Green to Blue with a Red scarf around the head. Nice! I like it! Got no time to produce any units in the next month myself but if some new units come in I could probably add them to the template. For the boat credits go to Ngunjaca. I took the rear boat from his tribal amplio set and modified it a bit. Last edited by XYZ on Sun Jan 20, 2019 5:39 am, edited 1 time in total. Alternative line infantry and a modified dragoon. Last edited by XYZ on Tue Jan 22, 2019 4:04 am, edited 1 time in total. 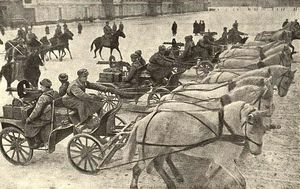 May I ask for mounted infantry with tachanka? I have no idea, how to fit it into 30x30 image. It is missing link between Cavalry and Mech. Inf. Consider it done, although I earmarked the green uniformed soldier on horse as mounted infantry. I didnt update the template... Mounted infantry is now on the right side of the second infantry line where it should belong. Anyhow, the tachanka would mark it more visible as a mobile infantry and not cavalry although the distinction is blurry. Thank you, it looks very good, if compared to my attempt (I tried to put 2 fellows on cart and there was no place for machine gun). Version for amplio also looks good, real tachankas were factory painted green, but improvised carts contributed from peasants were also in use (and it give better contrast). I will show my ugly creations to reference: trident: amplio: (the latter one is just black-white graphics which I colorized). Easily solved. Just change the size of the pic (I use paint.net btw) and copy the pixel into a new 30x30 empty frame and you can fit in a new wheel. It looks great now, you have got a talent arranging these pixels.